Happy Friday! Who’s excited about the weekend?? I know many of you are artists, designers, and creative people ,and I’m super excited to share this awesome resource with you all! Artists Helping Artists is a weekly podcast all about marketing and selling artwork online successfully. But really, the tools and marketing tips that are discussed would be a game-changer for any business. So, if you have a bit of downtime this weekend, pour some coffee, grab a pen and paper, and pick your topic! I’ve listened to several over the past few days and have loved each one. 1} Paint, paint, paint. Several artists I have heard paint every single day, many complete a full painting each day! You can’t help but become amazing when you do that day after day, year after year! Wow. 2} Present your work online the same way you would in a gallery. Make sure your website not only looks amazing and your paintings are large and lovely, but easy relate to, and super simple to buy! 3} Find your core audience, excite them, and they’ll spread that excitement to their group, and, of course, that will snowball until you rule the world. 4} Utilize social media to the fullest. Twitter, Facebook, and Pinterest, are your new best buds! Just know there is a time to market online, and a time to get dirty with your paints (or whatever you do)! 5} Blog and blog often. People love the stories behind the work, so be willing to reveal a few little behind-the-scenes stories. 7} In this economy, paint a bit smaller and sell prints! You’ll still sell your work, and, eventually, your collectors will come back for that ginormous wall sized piece. 8} Work on a series, a body of work, and make it into an event! Maybe even take that series and create a book or e-magazine you can share as a promo tool. 9} Get out of the art world and into the real world! That’s where the buyers are! 10} Always be your self. You are the artist or designer. You have to represent your work in front of the world. Follow you passions and work on what excites you. That will be your best work. This is seriously the tip of the iceberg. 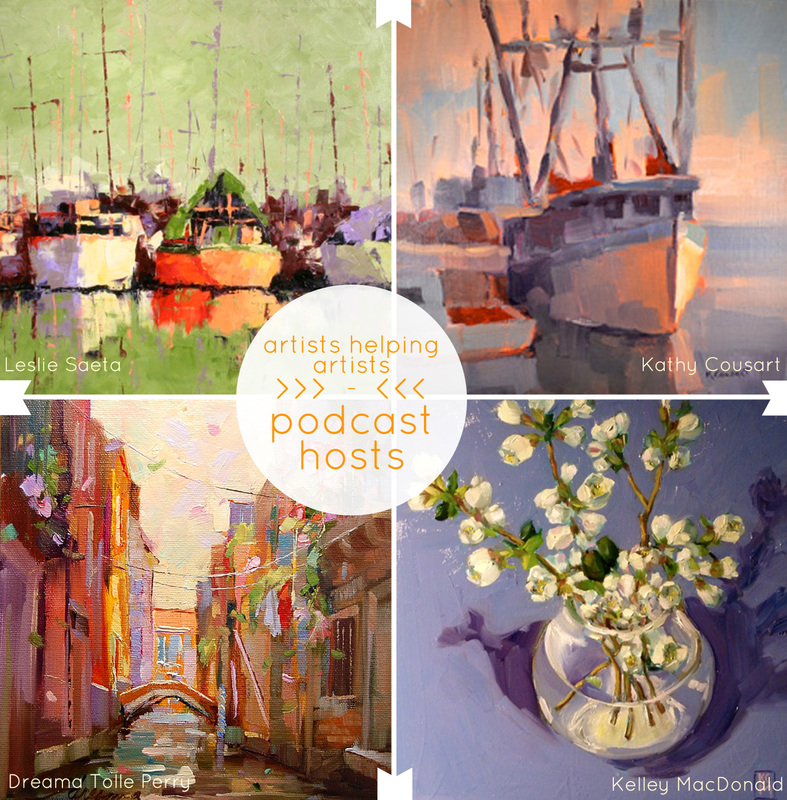 There is a wealth of knowledge, encouragement, and help in each Artists Helping Artists podcast (also available on iTunes! For free. Oh yes.). Enjoy! My pleasure! I really could have gone on and on, but thought it might be better if you all just listen to the podcasts yourselves! They’re very easy to get into. Your post was informative in itself, but I will go and listen to the podcasts as well. Feeling a bit overwhelmed by it all right now…but, its still fun so it must be right! Have a great weekend! Pick a project and work on that, then pick another project… one at a time. Have fun listening to the podcasts! I know you are going to find them very helpful. What a wonderful post all about AHA show and artists marketing their work. I, myself, learned so much from the shows and was honored to be asked to help out. I would encourage everyone to check out a few by topic that sound interesting to them and listen while they paint and be ready to take notes too! Full of great information and Leslie Saeta is a whiz at both marketing and also a very talented artist. Great combo. Thanks for the mention and appreciate your thoughtfulness. Take care!! Thanks so much for featuring the AHA radio show on your blog! The show is a labor of love and a lot of fun! If you or any of your listeners have any ideas for future programs please let me know! Thank you for posting this. I have just started listening to the programs…there are so many!! I am not sure where to start, but I have. I am about to venture out into the art world after 17 years of teaching art. I am excited and a little anxious, but these shows have given me a lot more confidence. Thanks again for posting this! Reblogged this on Through an Artist's Eye.